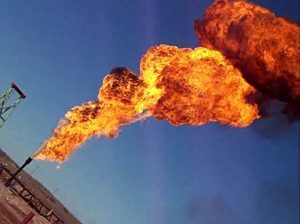 A natural gas flare stack is a piece of equipment that is used to burn off an excess of flammable gas. This gas is commonly found when drilling for oil but can also be found when drilling for gases. During these processes, it is possible to burn off the extra gas that is commonly found when searching for other raw materials. Burning off this extra gas can be a safety precaution as the pressure from the gas can cause damage to the industrial equipment if there is to much pressure built inside. It is also a safety precaution in terms of the health of humans globally as flaring also helps get rid of what is called volatile organic compound (VOC). VOC’s are organic chemicals with a high vapor pressure at room temperature. It is important that we get rid of these chemicals as they pose a health risk to not only us but to the environment as well. When drilling for oil you also often find gas accompanied with this oil. Flares burn off the gas that cannot be processed or sold. Losses from burning excess gases are typically the largest loss in many industrial operations. When drilling for oil offshores, this is particularly true as there is nowhere to store excess gases. It is estimated that 1/3 of all the gas collected globally through drilling is burned off. The most common of the gasses is methane. When methane is burned it releases carbon dioxide and water. Though this sounds bad, it is actually one of the least harming of the fossil fuels burned regularly. If you have ever seen an offshore oil rig you may remember seeing flames burning up into the sky from the top of them. This, in most cases, is the natural gas flare stack burning off the unwanted gas. It is an amazing site to see and is what is most rememberable about flare stacks and its flaring process. The emissions of VOC’s creates smog that hurts our environment. We here in the USA, flare more gases than any other nation. This was starting to cause our air quality to diminish globally. In order for the world to have cleaner air, on August 16, 2012, EPA finalized their standards. These standards are the Quad-O standards. In order to operate in the USA, oil and gas drilling companies must meet the Quad-O standards. It is the companies responsibility to know and comply with these regulations. Reaching above emission limits can be a serious issue. This is because failure to comply with the regulations can result in substantial penalties and EPA may revoke or suspend your certificates that are needed to operate legally. If you are having trouble with compliance there are companies such as Vaprox that can help you meet these standards. As you can imagine, it is important to keep that smog to a minimum for many reasons. Whatever your reason may be, if ‘zero emissions’ is your goal, you should consider getting a vapor recovery unit (VRU). Check out our VRU page for more details.